Since the same stuff comes up over and over, I thought I would make a post with ready-made searches. If anyone can come up with more, feel free to add. The links below are the actual thread titles, or links from the DIY section. Where is a good site to find M3 bumpers? M3 Diffuser fit on non-M bumper? Have you lowered your car yourself? the effects of big wheels ? What rims do you have on your car? Which Spark plugs to buy?? cheap BBK for our cars? Are M3 front BRAKES WORTH THE SWAP? Brakes squeaking after new brakes installed. What is the deal??? What kind of oil do I put in my e36? Last edited by ducky328i; 08-06-2010 at 08:00 PM. I call BS - there's no bmw driver that can't run his car faster than any magazine has ever done before. Last edited by chemguy; 07-08-2005 at 05:02 PM. Last edited by shogun; 01-14-2016 at 11:13 PM. 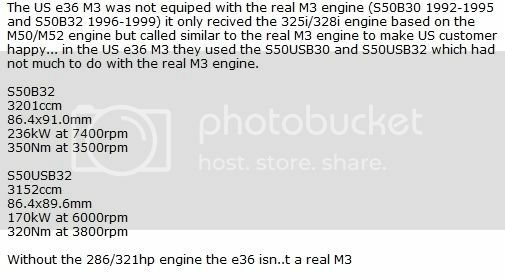 Great article written by Dudesky outlining common problems for those considering buying an e36. hey could you add this link to the front page faq since i know quite a few people have had this problem and this is the best fix. I nominate Hellrot325's 'headgasket DIY' writeup to be stickied in this index... great resource. Just used it while swapping heads, barely even opened the Bentley! Also sells the gears. Just ordered mine. I'm here for the snobs! wrecked daily driven early model e30 (light mods) part out CLICK! i dont think i saw this in the list but this HAS TO BE in this thread!!! i found this site while researching my erratic fuel guage problem. go to this link which is the 'common problems' area. it lists more than BMW's but for instance i went to this area, Faults on BMW sensors, which details sensor failures very thoroughly. Last edited by sprocket1200; 07-20-2007 at 06:10 PM. Last edited by InlineSixx; 10-22-2008 at 04:58 AM. bently download link is broken! !